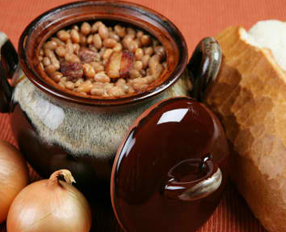 As the dish’s name implies the common way to make baked beans is in a casserole bowl or a cast iron skillet and baked. However, it is not unusual to stew them on top of the stove. Just about every region has its own way of doing it. 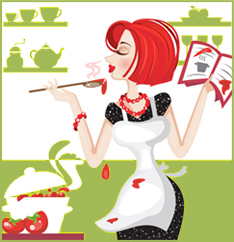 The famous Boston baked beans usually use a sauce made from molasses and pork. It doesn’t surprise us that since Maine and Quebec produce a lot of maple syrup they like to incorporate that into their sauce. Some countries use tomato sauce as the base. If you like, you can use navy beans and soak them overnight. This recipe uses canned pork and beans and I think it comes out just as good. I like to cut my onions and green peppers up in rather big pieces. That way if anyone is persnickety about onions and or green peppers they can pick them out easily and still enjoy your baked beans. Try to get them as close to the same size as you can. This is a trick my Mother, Dorothy, taught me. OPTIONAL: cut up the other half of the onion and put them in your dish before you serve. You would be surprised how some people like that fresh onion crunch and taste in their beans. Fry the bacon in a large deep sauté pan until it has partially cooked and about half of the drippings are released. Remove the bacon and drain on paper towels. Add the onions and peppers to the drippings in the pan to give them a rich smokey flavor. Add the beans and the rest of the ingredients (except the optional raw onions). Let this simmer for about 2 minutes, stirring constantly. If you don’t have a large enough pan to hold the ingredients and the beans, you can do the beans first, then transfer them to the casserole dish and add the rest of the baked bean ingredients after they have simmered in the sauté pan. Put the simmered bean mixture into a greased 13 x 9 oven proof casserole dish or bowl. Bake for about 2 hours. The beans and the sauce is bubbly and about as thick as syrup.